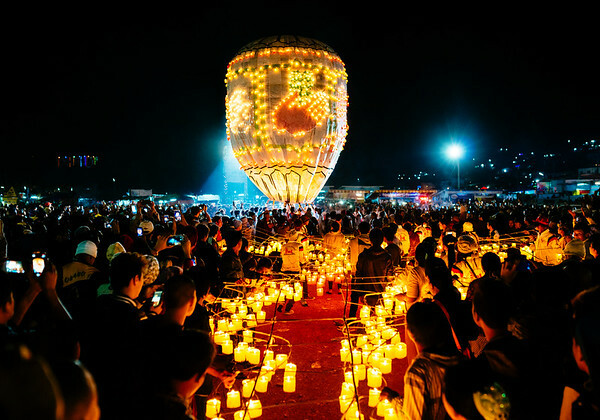 North of Yangon sits the city of Bago, a popular rest point for those heading to the Golden Rock. Ago is also known for it’s pottery, and the area has many workshops where individuals labor day in and day out throwing, molding, pounding, and then firing clay pots. The pots are used for anything and everything: holding drinking water, transporting water, plants, food storage, etc. They range in size from the small and hand-holdable, to ones so large a person could easily fit inside. During our visit, we were able to stop at a workshop run by the same family for generations. 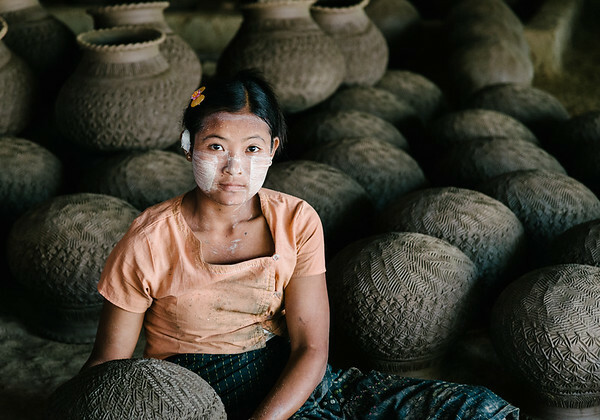 They saw the pots through the entire process, from collecting the clay from nearby riverbeds all the way to selling the finished product. I watched at two people threw the clay on foot powered potters wheels, forming the basic pot. Those pots were then set in the sun for several hours to harden, after which this young woman would hammer, by hand, the patterns and reliefs into each pot, as seen in this image. It was amazing watching her work. She used a hand crafted wood mallet with a design etched into the face of the hammer. And each whack of the hammer against the semi-hardened clay hit exactly where it was supposed to; no two strikes overlapped. It took her maybe four minutes to do one pot, and she did this for 200-300 pots a day, while sitting on a dirt floor in a covered workshop open to the heat and humidity. I didn’t see many people in Myanmar sweat, but this woman, as you can see, is perspiring. 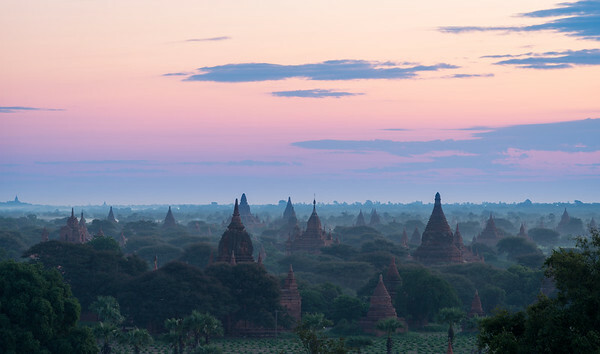 There are only about seven pagodas in Bagan that people are still allowed to climb. That means, one has to get to the good sunrise spots early, or else you’ll be relegated to the lower tiers of the pagoda with views not quite as good. This morning I arrived early and go my choice of spots, choosing one that would let me to shoot in different directions as the sun rose, I found myself shooting many different compositions. Clouds low on the horizon in the distance obscured the actual sunrise this morning, but a short while later everything worked out. With the sun cresting over those low clouds, the sun rays became visible in the sky, the clouds were painted a wonderful golden hue, and enough light fell on the landscape to illuminate the beautiful stupas and pagodas spread out before me. This is one of those sunrises that I will remember for years to come. Not far from Mandalay, but still ann effort to get to, is the ancient imperial capital of Inwa. 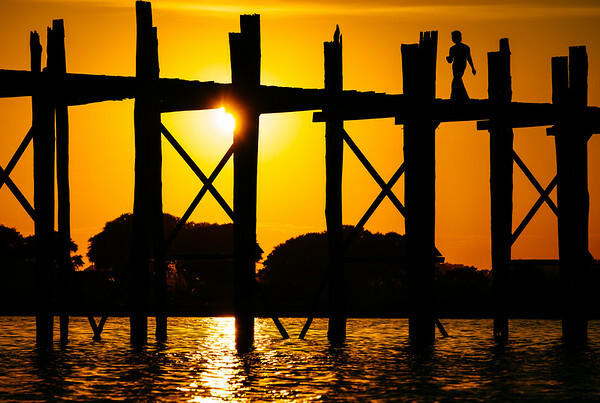 Throughout Myanmar’s history, Inwa has been built, destroyed, and rebuilt numerous times. Thankfully, some of the incredible structures, such as the Bagaya Monastery, have survived. First built in 1593, this is a large monastery built from teak wood. The structure is impressive, and the 267 enormous teak wood posts that form the backbone of the building are truly incredible. We arrived in early afternoon, as the sun beat down relentlessly from a cloudless sky and the humidity rose to near unbearable highs. Leaving our shoes at the entrance to the monetary, we quickly made our way into the interior shade and cooler floor. Once inside, I came across a wonderful scene: several photographers and two nosy monks engaged in a photo shoot. After getting permission (I didn’t want to intrude in their session), I was able capture a few lovely images showing a dichotomy that is ever present in Myanmar: the intersection of classical and traditional culture and modern technology. 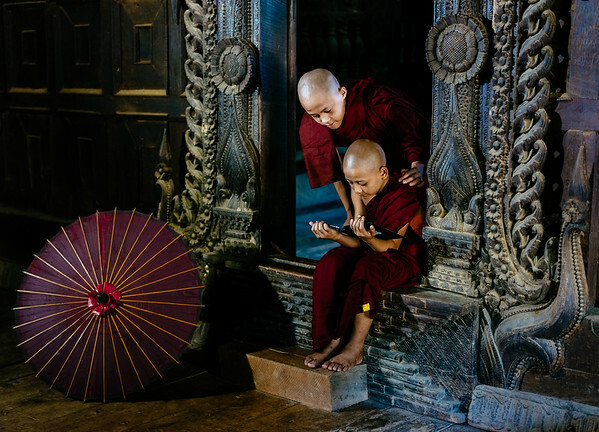 Here we have two novice monks, sitting in a 500+ year old handcrafted monestary, with a traditional handmade mulberry paper umbrella, all while one of the monks is looking at an iPad. The intersection of traditional and modern. While I would not have chosen to stage the scene like this, I think the idea is great, and I’m thankful for the other photographers who allowed me to capture some images. There are times in photography where things are just lucky and work out. This image is the result of one of those times. I went to Myanmar with all my panorama gear, but didn’t take many pano images; not even this one. 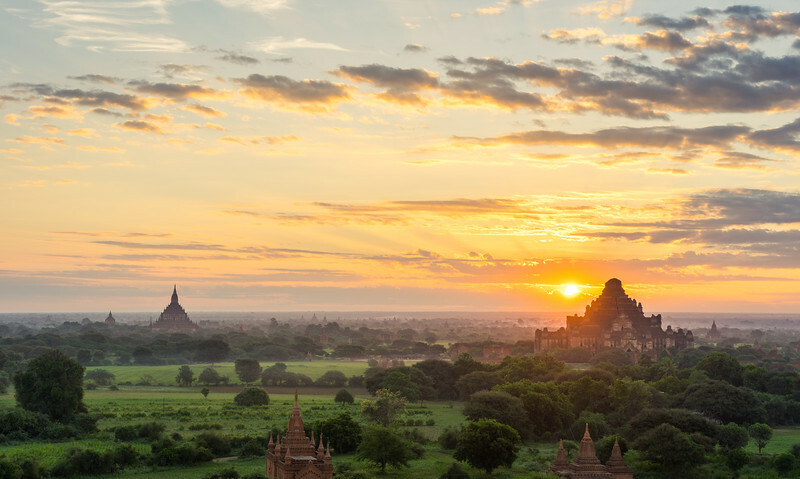 High atop one of Bagan’s stupas, I had set up to photograph sunrise. Having arrived at the top of the stupa early, I was able to get my choice of spots, and choose one that would permit me to shoot in different directions as the sun rose, I found myself shooting many different compositions. It wasn’t until I got home a few weeks later and did another review of all the images that I noticed I had taken two images about 45 seconds apart from each other, and they overlapped quite a bit. Not thinking anything would come from it, I exported them into Photoshop and had the program attempt to make a pano out of the two images. This is the result. One of my favorite images from the trip to Myanmar…and one that would not have been created if I hadn’t decided to give it a try and see what came from it. Isle Lake is one of the places in Myanmar that attracts the intrepid and casual traveler alike. There is a sense of exotic serenity as one reads about the lake and contemplates visiting. Self-induced images of a hotel room perched on long narrow stilts above the lake surface, traveling during the day by boat with wind in ones hair, and witnessing a traditional culture where life is based and depends on the lake. While these images might be imagined before one arrives at Inle Lake, it quickly becomes apparent that what was imagined is reality. Life moves at a pace here that is dictated by the rains and lake, with people living over the water year round in homes built atop bamboo poles. Transportation is via long handcrafted boats; propelled by motors for those with money, and by paddles for those without. I’ve visited many places in my life, and in most I would say that daily life and then environment are intertwined but not inseparable. That is not the case here. While I only had the chance to visit for a brief stint, I came away with the strong notion that life here is fully integrated with the lake, and without the lake the people would struggle to survive. Of course, they can and do adapt: changing environment, increased tourism, etc. But, the sense I got here was one of togetherness: the people and lake as one. In this image we have one such example: a fisherman, accomplishing his craft in the traditional way using a conical net while rowing with his leg. Of course, what can’t be known from just looking at the image is that this fisherman no longer uses his net to catch fish, but rather to show his proud tradition to visiting travelers. The economics of Lake Inle have changed, and while there used to be hundreds of such fisherman plying the lake each day for food, now they almost all use more modern nets or long fishing lines and hooks. This man, however, has kept alive the tradition of his family and the lake, and he will gladly demonstrate it to anybody passing by. 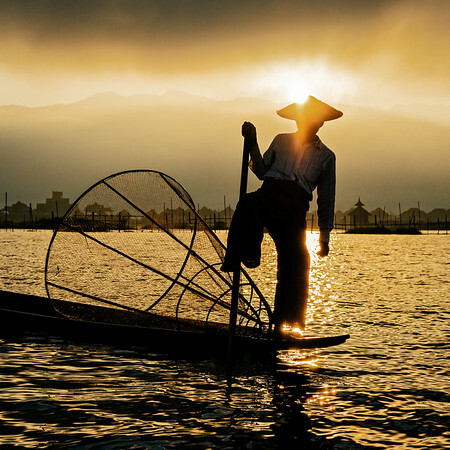 In this image a traditional Inle Lake fisherman kneels on the bow of his boat and prepares to launch his conical net into the water. It’s early in the morning, with the sun having just crested the hilltops and beginning to cast its rays onto the lake. 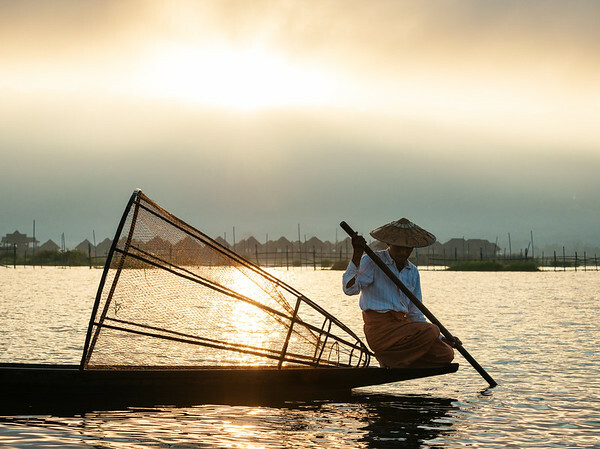 Life on Myanmar’s Inle Lake moves at a pace dictated by the rains and lake, with people living over the water year round in homes built atop bamboo poles and transportation via long handcrafted boats. It all seems so peaceful, and I think this image captures that sense of peace. I’ve visited many places in my life, and in most I would say that daily life and then environment are intertwined but not inseparable. That is not the case here. While I only had the chance to visit for a brief stint, I came away with the strong notion that life here is fully integrated with the lake, and without the lake the people would struggle to survive. Of course, they can and do adapt: changing environment, increased tourism, etc. But, the sense I got here was one of togetherness: the people and lake as one. In this image we have one such example: a fisherman, accomplishing his craft in the traditional way using a conical net while rowing with his leg. Of course, what can’t be known from just looking at the image is that this fisherman no longer uses his net to catch fish, but rather to show his proud tradition to visiting travelers. The economics of Lake Inle have changed, and while there used to be hundreds of such fisherman plying the lake each day for food, now they almost all use more modern nets or long fishing lines and hooks. This man, however, has kept alive the tradition of his family and the lake, and he will gladly demonstrate it to anybody passing by. 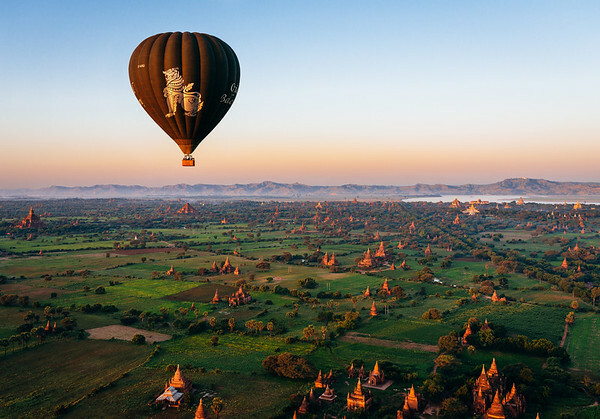 With a predawn wake up call and hotel pickup, we were off to the staging area where we would begin our hot air balloon journey over the temples of Bagan. What an incredible experience as I think back upon it. Watching the balloons inflate, getting into the basket, and then taking to the air for an adventure over this magnificent landscape. I had seen many of Bagan’s pagodas and stupas the day before, but this was a completely different view, literally and figuratively. Only from above can one begin to grasp the scale at which these temples were built, in size, over time, and across the distance of the plain. The sky began to brighten shortly before we took off, but finished its rise over the horizon while we were in the air. The sun’s rays cast soft pink hues over the distant hills, most likely accentuated by the cook fire smoke and dust in the air, while turning the temples a deep red and the vegetation a lush green. 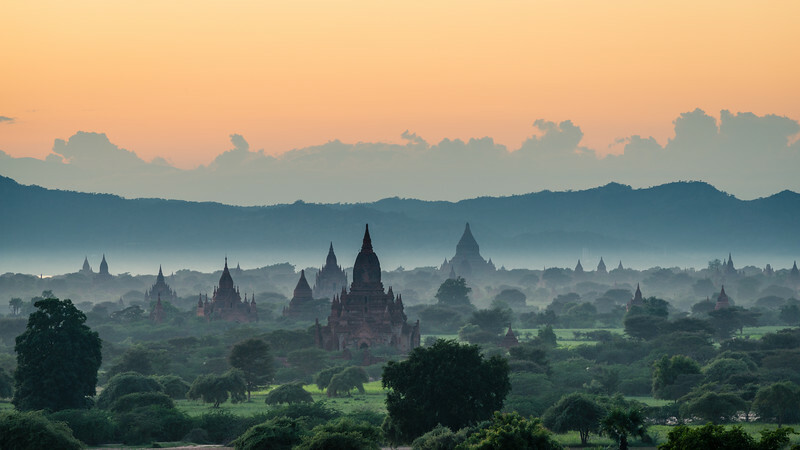 I don’t think I would ever get tired of photographing Bagan at sunrise. Well, maybe I would, but it would take a long time for me to get tired of it. Each morning I was there, the sunrise was a spectacular event, and different from one day to the next. In this early morning shot, the sun had yet to break the horizon, but it was already turning the sky a beautiful pick and lavender color. Small fires used for cooking created a low lying haze in pockets throughout the plain, and make it look as if fog had settled in over night. Shot from one of the seven pagodas that people are still allowed to climb, I captured this image just after the sun had dropped below the hills in the distance. The sky was still had a warm and soft orange glow, while the trees and grass were turning from a vibrant lush green to a cooler hue. From atop any Bagan pagoda or stupa the view is simply stunning. No matter which direction you turn or look, hundreds of ancient architectural wonders meet your eyes. You can’t escape the sight of spires rising above the plain. And, why would you want to escape such an incredible view; one that is found only here in Bagan, along the banks of the Irrawaddy River. This image was captured as the sun was rising at Kyaiktiyo Pagoda, better known around the world as Myanmar’s Golden Rock. The sky was a dull grey, filled with a layer of overcast clouds, which limited the options for photographing sunrise. Instead, I decided to focus on the rock and the people who had made the pilgrimage to this holy place. While this image does not show the sheer scale of the Golden Rock, I believe it helps portray a softer and more personal side of the rock and the people who travel long distances to reach it. 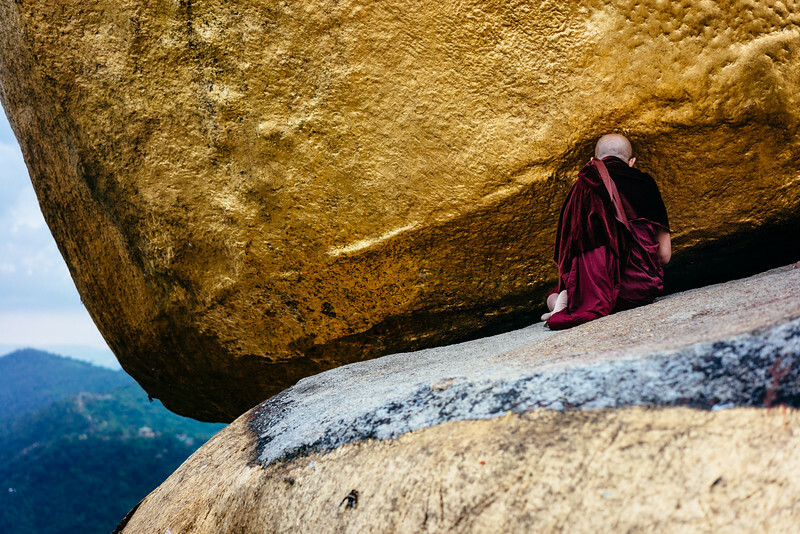 This young novice Buddhist monk was one of many I saw praying at at the Golden Rock. But, his concentration and devotion, as demonstrated by the long time he was in this position—far longer than anybody else I witnessed—showed how much it meant to him to be in this place at this time. That is a hard image to capture and portray in a photograph, but I think some of it comes across here. The Kyaiktiyo Pagoda actually sits on top of the gold encrusted rock, but can’t be seen in this image. According to legend, the Golden Rock is perched on a strand of the Buddha’s hair, which keeps it from falling down the cliff. My guide said it was two hairs, but who’s counting. Men are allowed to approach the rock and place gold leave on its surface, which over the years has created a thick gold coating to the rock. Isle Lake is one of the places in Myanmar that attracts the intrepid and casual traveler alike. There is a sense of exotic serenity as one reads about the lake and contemplates visiting. Self-induced images of a hotel room perched on long narrow stilts above the lake surface, traveling during the day by boat with wind in ones hair, and witnessing a traditional culture where life is based and depends on the lake. While these images might be imagined before one arrives at Inle Lake, it quickly becomes apparent that what was imagined is reality. Life moves at a pace here that is dictated by the rains and lake, with people living over the water year round in homes built atop bamboo poles. Transportation is via long handcrafted boats; propelled by motors for those with money, and by paddles for those without. I’ve visited many places in my life, and in most I would say that daily life and then environment are intertwined but not inseparable. That is not the case here. While I only had the chance to visit for a brief stint, I came away with the strong notion that life here is fully integrated with the lake, and without the lake the people would struggle to survive. Of course, they can and do adapt: changing environment, increased tourism, etc. But, the sense I got here was one of togetherness: the people and lake as one. In this image we have one such example: two fisherman, accomplishing their craft in the traditional way using a conical net while rowing with his leg. Of course, what can’t be known from just looking at the image is that this fisherman no longer uses his net to catch fish, but rather to show his proud tradition to visiting travelers. 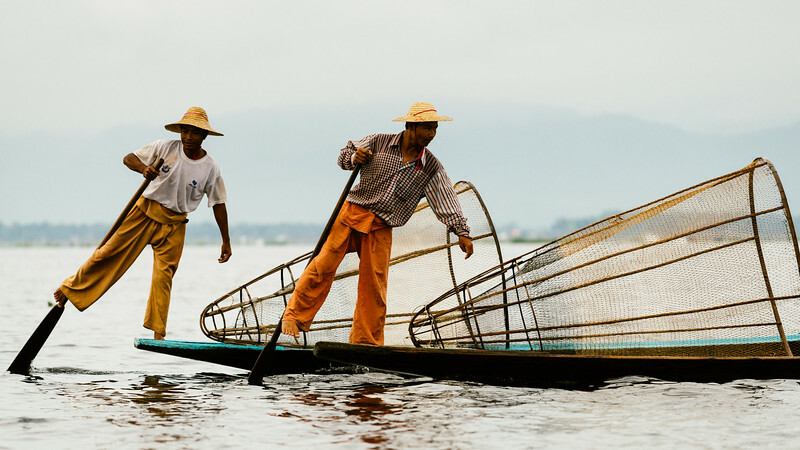 The economics of Lake Inle have changed, and while there used to be hundreds of such fisherman plying the lake each day for food, now they almost all use more modern nets or long fishing lines and hooks. This man, however, has kept alive the tradition of his family and the lake, and he will gladly demonstrate it to anybody passing by. There are times in photography where things are just lucky and work out. This image is the result of one of those times. I went to Myanmar with all my panorama gear, but didn’t take many pano images; not even this one. High atop one of Bagan’s stupas, I had set up to photograph sunrise. Having arrived at the top of the stupa early, I was able to get my choice of spots, and choose one that would permit me to shoot in different directions as the sun rose, I found myself shooting many different compositions. It wasn’t until I got home a few weeks later and did another review of all the images that I noticed I had taken two images about 45 seconds apart from each other, and they overlapped quite a bit. Not thinking anything would come from it, I exported them into Photoshop and had the program attempt to make a pano out of the two images. This is the result. One of my favorite images from the trip to Myanmar…and one that would not have been created if I hadn’t decided to give it a try and see what came from it.